Studies show that children who attend early-learning programs demonstrate higher levels of achievement and better social adjustment, and are more likely to graduate from high school. During the time period prior to entering kindergarten, the human brain undergoes rapid development. It’s when a child builds cognitive skills as well as character skills, social-emotional growth, gross-motor skills, and executive functioning. FRISTERS (fristers.org), a nonprofit organization dedicated to supporting teenage mothers and their children, just announced its Kidsters program for early childhood development and kindergarten preparedness. 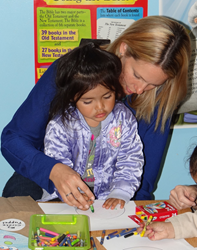 The program is divided into two main groups – the nursery for 3 months to 2 years, and the preschool for 3-5 years. Though the objectives and loving care remain the same, activities, materials, and methods are modified for each age group. Kidsters also provides a nutritious dinner for the children. For many of them, because of their extreme poverty, the meal they have at Kidsters is one of the best they will have all week. For children 4 and 5 years old and not yet in kindergarten, Kidsters offers Ready Set Go, a specific curriculum and one-on-one coaching for their mothers to specifically guide them in kindergarten preparations to assure a high level of readiness for the child. Every month the mothers within the program are gifted a book to read with their child at home, including a list of follow up questions and activities to help children with comprehension, print awareness, and book handling. Assessing preschool children is particularly difficult in comparison to assessing other age groups. Their short attention span, their likely distractibility, their inconsistent performance in different environments and when strangers are present, all impact their behavior and attitude to “doing” and potentially learning. Formal assessment conditions are prone to sometimes give a distorted picture of children’s real abilities. FRISTERS utilizes an assessment method that consists of formal observations of the children in informal and normal classroom settings, accompanied by note taking and further record keeping. It is an on-going process to determine children’s strengths and needs. Also, statistically, children of teen mothers suffer higher rates of abuse and neglect, developmental delays, and emotional disturbances including hyperactivity, impulsive behavior, anxiety, loneliness, aggression, and low self-esteem. Because the majority of teen mothers do not put their children into preschool, nor do they have a support system around them, these issues rarely get noticed or addressed. Left undetected, issues can advance, creating more serious lifelong consequences. Kidsters is only offered for the children of teen mothers enrolled in FRISTERS LifeCoach program and all services are free. If you know of a teen mother in need, please urge her to contact FRISTERS president and founder, Ali Woodard, or any of her wonderful staff at 949-387-7889 or info(at)fristers(dot)org. For more information about FRISTERS and for a complete list of FRISTERS locations, visit fristers.org. FRISTERS is a nonprofit organization, founded and operated on Christian principles, and is dedicated to supporting teenage mothers and their children. Every year over 400,000 teens give birth in the United States. Many lose the support of family and friends. Most have no high school diploma, no job, no driver’s license or car, and statistics show that nearly 70% live at the poverty level. FRISTERS is dedicated to breaking the cycle of poverty and abuse among teen moms. Since its inception, the organization has helped hundreds of young women graduate high school, enroll in college and vocational training schools, get drivers’ licenses, find employment, get off of welfare and become loving, caring, responsible parents and role models to their children. FRISTERS offers LifeCoach, a weekly program for teen moms, pregnant or parenting, within the ages of 13-24, and Kidsters Childcare and School Readiness Program for their children, ages 0-5. These programs and services are provided to the community free of charge, regardless of religion, race, or ethnicity and there is no religious requirement for participants. For more information, please visit fristers.org.